The City of Linz, Austria, launched the first municipal initiative in Europe to build a vibrant public–civil–private digital ecosystem – the Linz Open Commons – to serve the needs of public administration, citizens, enterprises, science, arts communities and educational institutions. Linz, the provincial capital of Upper Austria, has approximately 190,000 inhabitants and is usually considered an industrial, blue collar town. Nevertheless, the city is open to both cultural and technological change as important drivers for an improved quality of life. In 1979, the City of Linz became known for its pioneering experiments with digital culture by hosting the “Ars Electronica,” an initiative that is at once an avant-garde festival, a showcase for excellence in digital art, and a media art lab providing artistic expertise for R&amp;D projects. Christian Forsterleitner, member of the municipal council, explained, “The foundations of an Open Commons Region are the digital, freely accessible public goods of a society. That means free and open source software, open data, open street maps, open educational resources, and freely accessible creative works in the areas of film, music and photography.” Gerald Kempinger, as the Chief Information Officer of Linz, notes, “We welcome every initiative – from citizens, community groups and enterprises” (Glechner 2010). In 2010, the information technology department of the city, in collaboration with Gustav Pomberger, professor of computer science at the Johannes Kepler University Linz, published a study on the “Open Commons Region Linz” (Kempinger and Pomberger 2010). 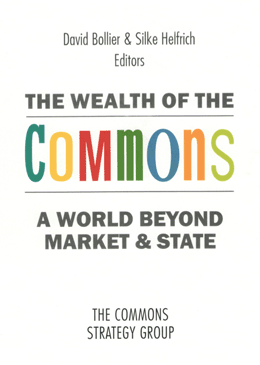 The report summarizes the role of local government in establishing an Open Commons Region. In the past, public funds for economic development had largely focused on capital-intensive infrastructures like roads or civic institutions. In a knowledge economy, it makes sense to also invest in intellectual growth, shared data, and ideas. In this context, the role of the government is to create a framework for making the sharing of information and knowledge easier. This means enacting appropriate legislation, building public awareness, and supporting new Open Commons initiatives proposed by citizens and private enterprises. The study suggested three major activities to establish an Open Commons Region. The first step was to explain the relevance of Open Commons to the inhabitants of Linz through a public awareness campaign and developing a brand. The second step was to organize, coordinate and encourage Open Commons activities through an office for coordination and assistance, and a system of open data for local government (Kempinger and Pomberger 2010). “The City of Linz needs to open its data sets,” noted Leonard Dobusch, researcher in the Department of Management at Free University Berlin and co-editor of the book Free Networks, Free Knowledge. “If the city fails to be a positive role model, the Open Commons Region will fail. In circumstances where the government has neither the resources nor the incentives to innovate, the public can take the lead and use the data for productive purposes.” The third step called for the city to network with other regions, to establish national and international cooperation to spread the idea of Open Commons, and to learn from other cities in Europe. By the end of 2010 the office for coordination of the Open Commons activities was launched. Its first project, begun in October 2011, was an Open Government Data platform to provide statistical data about Linz, election results, orthophotos (aerial photographs, geometrically corrected), maps, real-time public transport data and records of the municipal council (Stadt Linz 2010) . The second initiative was Clickfix, a geodata-based complaint management tool that lets Linz citizens report problems online. Inspired by the internationally well-known SeeClicFix or Fixmystreet, the system makes reports on each problem visible for everybody to see. It’s a win-win for both sides: citizens know how the city deals with their problem and the city administration can show how fast and reliable they are in solving a problem. The Open Commons Region is still a nascent project. But, so far, the response of Linz citizens, academics and the business community is encouraging. Many institutions have problems in understanding and identifying with the philosophy behind the Open Commons Region. However, the City of Linz and the many dedicated stakeholders of the new public–civil–private ecosystem are determined to fulfil the vision of an Open Commons Region. Interview with Leonard Dobusch. 2010. Glechner, Claudia. 2010. “Linz Sees Open Commons Future.” Futurezone, August 24, 2010. Kempinger, Gerald and Gustav Pomberger. 2010. “Open Commons Region Linz. http://www.linz.at/images/ko-Studie_Open_Commons_Region_Linz.pdf. Stadt Linz. 2010. Open Data Linz. http://www.data.linz.gv.at. 1. Mike Linksvayer describes the Creative Commons licenses in Part 4. 2. See http://opencommons.public1.linz.at See also Benjamin Mako Hill’s essay about the implications of “openness,” in Part 4. Thomas Gegenhuber (Austria) has several years of nonprofit experience. He worked in Toronto for the think-tank nGenera insight that is chaired by Don Tapscott, conducting research on open government. He now contributes to such projects in Linz and blogs at http://thomas-gegenhuber.at. Nauman Haque (Canada) is currently the Associate Research Director for the Enterprise Council on Small Business at Corporate Executive Board. Nauman has a decade of experience in the research and advisory industry. He has conducted research and provided thought leadership on a variety of topics, including enterprise collaboration, social media, digital identity and customer behavior.